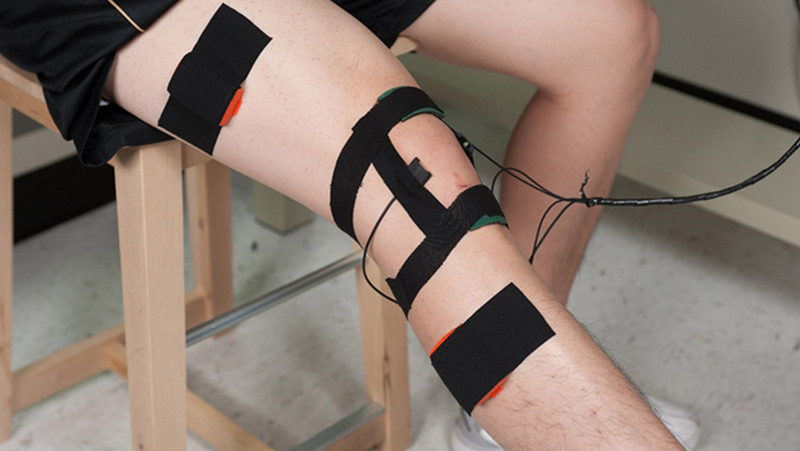 Researchers at the Georgia Institute of Technology have developed a knee band that is equipped with microphones and vibrational sensors to record and analyze the sounds the joint makes. This non-invasive methodology has the potential to diagnose injury and track recovery progress while being inexpensive compared to imaging techniques. Knee injuries can result from twists and sprains to ligament tears. Omer Inan speaks from experience; the former athlete, now an assistant professor of electrical and computer engineering, suffered knee damage after years of training. As a discus thrower, Inan would lift weights and spin his body, generating large amounts of stress and torque on joints that were never meant to do that. As time went on, his knees began to pop and ache more. The Defense Advanced Research Projects Agency (DARPA) called for research on wearable technologies for rehabilitation. Inan’s research group pitched the idea of a device embedded with acoustical sensors that are placed around the knee, that would be used as a point-of-care solution to a knee injury. The research was quickly sponsored by DARPA leading to proof-of-concept experiments. Hearing the cracks and gurgles of one’s joints is disconcerting. Certain sounds can be attributed to bone rubbing on other bones or on cartilage. The design of the band used a piezoelectric sensor as a contact microphone. The piezoelectric effect converts vibrations into an electric signal that can then be processed. The team made recordings of healthy a healthy knee and compared it to a knee that that incurred an anterior cruciate ligament (ACL) injury within the past seven days. The recordings were made while the knee was straightened and flexed. The two data sets showed that voltages from the injured knee were reduced compared to the healthy one. The recordings were passed through assorted filters, one that monitors for healthy knee acoustics and another that does the same for injured knees. As research ramps up, DARPA is keen to see medical research that can help monitor a soldier’s health. Musculoskeletal injuries are a common cause for discharge for active duty service members. Soldiers often carry backpacks weighing over 100 pounds (45.4 kg) and travel over long stretches of rough terrain. They also may encounter obstacles that they need to climb over or crouch behind for extended periods. Many injuries in the knees and ankles are treated, but re-injury can occur months afterwards which of course causes more damage. After surgery or treatment, the joint may feel healed resulting in false confidence in the joint. By monitoring convalescing knees, clinicians can avoid re-injury and prevent early onset osteoarthritis. This method shows promise to help reduce these problems, but there are still challenges before the device is patient ready. The knee is surrounded by fluid that dampens sound waves. Also, extraneous noise is caused by the subject when they move around, drowning out the useful sounds. For now, the device records sound in controlled environments where the subject is told to avoid moving except on command. Inan’s team is also trying to use the acoustical bioengineer to develop methods of monitoring the heart. Using similar principles, the team is working on wearable technology that will measure the cardiogenic limb vibrations. The opening or closing of the aortic valve is what gives the thumping noise found in heartbeats. This system could potentially be used to monitor heart health and prevent heart failures.